One of Elizabeth Warren's rivals in the Democratic race for president is coming to her defense in the face of attacks by President Donald Trump's re-election campaign. Sen. Kirsten Gillibrand (KEER'-sten JIHL'-uh-brand) says Trump's name-calling is "irresponsible" and "unpresidential." Warren entered the 2020 race on Saturday, and Trump's campaign immediately issued a statement citing the Massachusetts senator's past claims to Native American heritage. Trump campaign manager Brad Parscale says Warren has been "exposed as a fraud by the Native Americans she impersonated and disrespected to advance her professional career." Gillibrand tells reporters in South Carolina that Warren "has been an extraordinary public servant" who "will keep fighting for Americans." The New York lawmaker says that how Trump "treats women, particularly women of color, is outrageous." Sen. Elizabeth Warren has concluded the launch of her presidential campaign at a rousing rally in her home state of Massachusetts without a mention of the controversy over her past claims to Native American identity that continue to bedevil her campaign. Warren did mention Native Americans on Saturday, as one of several groups, including Latinos and disabled Americans, whom she argues the system is "rigged" against. But she offered no further explanation in her kickoff speech about her previous identification as a race other than white. She has connected that decision to family stories she heard growing up and has apologized to Native Americans troubled by the claim. The Massachusetts Democrat joins a crowded field in her party's primary. She'll battle at least five fellow senators for the nomination and chance to challenge President Donald Trump in 2020. President Donald Trump's re-election campaign has taken quick note of Elizabeth Warren's presidential candidacy and is sharply criticizing the Massachusetts Democrat, citing her past claims to Native American heritage. Trump campaign manager Brad Parscale says in a statement that Warren has been "exposed as a fraud by the Native Americans she impersonated and disrespected to advance her professional career, and the people of Massachusetts she deceived to get elected." Warren's entry into the 2020 race on Saturday comes after she's apologized for claiming Native American identity on multiple occasions early in her career. It's a claim that's created fodder for Republicans and could overshadow her campaign. Parscale says voters "will reject her dishonest campaign and socialist ideas" that, he says, "will raise taxes, kill jobs and crush America's middle class." 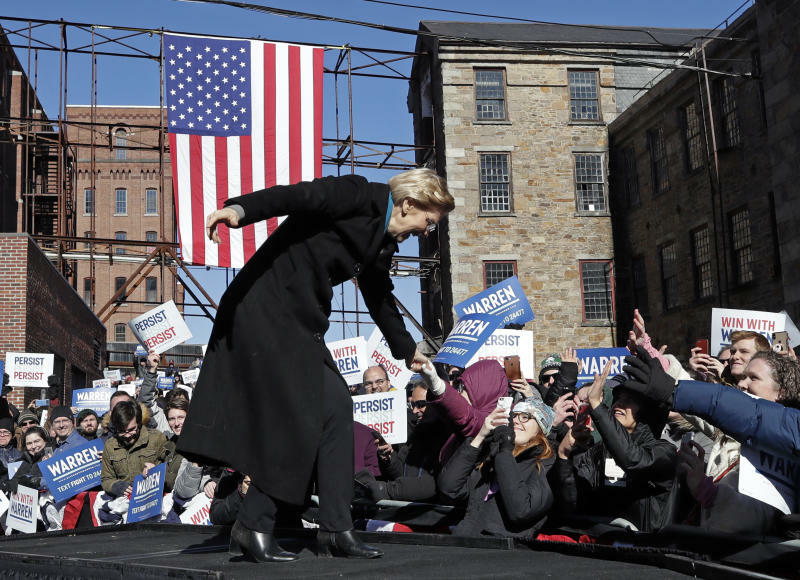 Sen. Elizabeth Warren has made her presidential candidacy official, kicking off her bid for the White House at a rally in the working-class town of Lawrence, Massachusetts. The Massachusetts Democrat joins a crowded field in her party's primary. She hopes that her call to fight back against a "rigged system" will resonate as she battles at least five fellow senators for the nomination and chance to challenge President Donald Trump in 2020. Warren has spent the past decade in the national spotlight, first emerging as a consumer activist during the financial crisis. Sen. Elizabeth Warren of Massachusetts was the first high-profile Democrat to signal interest in running for the White House in 2020, but it's now a crowded field. She's banking on a populist call to fight economic inequality, which she hopes will distinguish her and help her move past the controversy surrounding her past claims to Native American heritage. She later led the congressional panel that oversaw the 2008 financial industry bailout. After Republicans blocked her from running the Consumer Financial Protection Bureau, an agency she helped create, she ran for the Senate in 2012 and unseated a GOP incumbent.